When I was sixteen or so I got hold of a copy of the magazine Furore, made by Piet Schreuders. Before that moment it had never occurred to me that magazines were made by people, that are in essence not very different from me. And Furore was the best magazine I had ever seen in my life. There was a section in Furore in which Piet Schreuders mentioned all kind of private fanzines. This started me making fanzines, and until this very day it is one of the greatest pleasures in my life. Piet Schreuders has been a major influence in my life in many other ways. And not only in my life. I know many people who started designing, publishing or writing because of Piet Schreuders. Strange as it is, Piet still hasn’t a site of his own. So if you don’t know his work, you have to do a Google search. Last night I cleaned up my space a bit and saw a book that Piet has designed for his wife, Aletta. It is a collection of 365 little tales about cats, illustrated by Herwolt van Doornen. 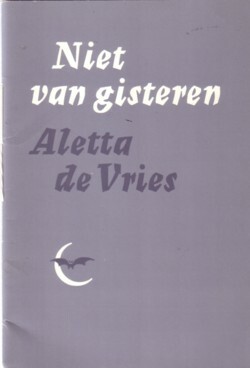 The book is not the first time that Aletta and Piet did together: in 1985 Piet made a booklet of some short stories that Aletta had written. Niet van gisteren was a private publication and I think that you will have to do a lot of effort to find a copy. 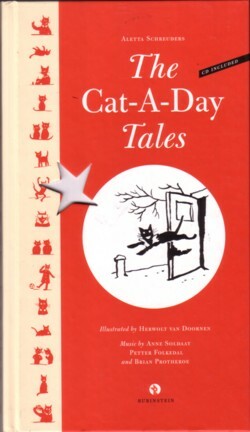 But the Cat-A-Day Tales was published by Rubinstein and is still available. Cat-A-Day Tales is a true labour of love. There is a CD included in the book with 13 songs about cats, also written by Aletta Schreuders and sung by Anne Soldaat and various other people. But there is one song that is not written by Aletta, but by Piet Schreuders. The vocals on this song are by Brian Protheroe, and it is called The sunstroke song . It is not my favourite song of this CD, but because it is the only song that I have that is written by Piet Schreuders, I choose it for today’s Soundtrack. Looking forward to it. I love your recent Splognarizers!